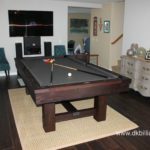 Another great looking Elkhorn Rustic pool table recently found a home in Oceanside, California. Our customers choose a Charcoal gray felt to complement the grain of the dark scraped finish. 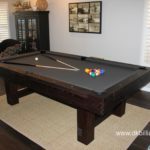 This eight footer plays like a champ, with backed three piece slate, and k-66 cushion rubber. Leather bucket pockets catch the balls. The Elkhorn is now available with an optional matching dining conversion top. 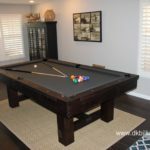 View our other rustic, contemporary pool table models online or in our Orange County showroom.